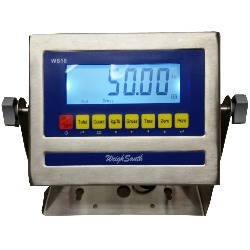 The Weighsouth WS2500XL10 Floor Scale comes factory calibrated with the WeighSouth WS-10 Indicator for a complete weighing solution for most any application in your warehouse. The large 3 foot wide painted steel deck is the ideal size for weighing most pallets and with the large 2500 pound maximum capacity, the scale works for the vast majority of customers perfectly. The 3x3 Floor Scale features rugged steel construction, NEMA 4 side access stainless junction box, 2500 lb x 0.5 lb capacity, and has adjustable feet on each corner for weighing on uneven surfaces. Shipped set up and factory calibrated, the WS2500XL10 Floor Scale will provide accurate weight readings time and time again. With its NTEP legal for trade approvals and outstanding price, the Weighsouth 3x3 NTEP floor scale is the ideal choice for your weighing needs. The scale system ships free freight to your location in the continental U.S. zoned business with loading dock or forklift. Contact us for a quote to AK, HI or Canada.